Le Blog de Frivole: Perfetti Perfect! 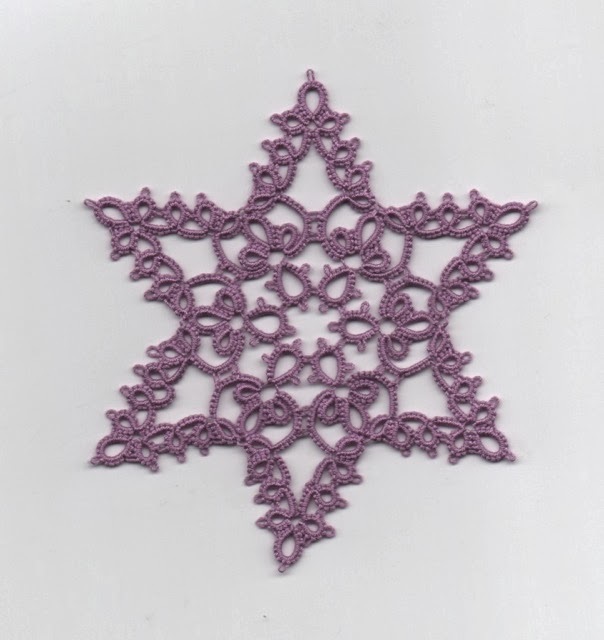 On a recent visit to In Tatters, I saw a thread by a lady who was explaining that she'd been using an iPad app (Kaleidoscope) to make tatting patterns! Well, that piqued my curiosity. I got the app…. I'm useless with it! And even more impressed that the lady in question, Robin Perfetti, was able to come up with these gorgeous patterns. She also kindly shared her first two beautiful designs called: First Snowfall and Late Winter Snowflake. Thank you Robin! The patterns can be found in the members patterns section. Aren't they great? but it hasn't come out very well on the scan. It's Lizbeth Antique Violet Light. And this is Lizbeth Country Grape Light. Sadly I'm not as perfect as Robin: all excited to complete the second snowflake so I could show you, I realised - too late - that I'd made a mistake on the last arm and had one too many rings! When I first saw them, I preferred the second one and that's the one I was particularly keen to tat. Now that I've made them, I actually prefer the first one. Oh, and thank you to everyone who helped me figure out the number of possible squares for my granny blanket! These are really extraordinary pretty snowflakes!! Ha! I downloaded the app as well. Deleted it in. 10 minutes!! Two lovely patterns, I must go and have a look at them, I will have a look also at that app too. Those snowflakes are really nice ! those snowflakes are lovely, I've discovered Kaleidoscope some times ago with the 4y dauther of a friend, it's easy and it could be a creative way to discover new shapes. I've an album "caleido" on facebook, if you like to see my attempts to use it, look my name up on fb, then go to photos and then albums. Lovely snowflakes. Again the great idea of applying modern techniques to an old craft, like your formula for granny square colours. Those are very pretty snowflakes! 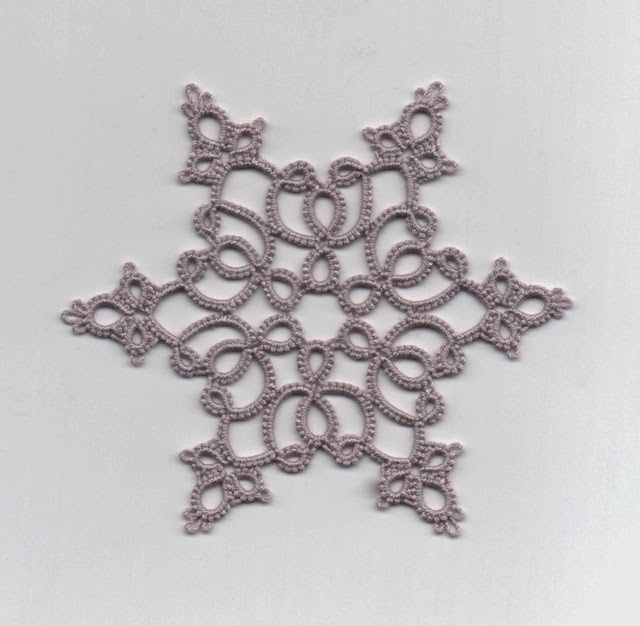 I have the kaleidoscope app, but I think I'd be useless trying to use it to design tatting. My brai just doesn't work like that!